After a some extensive pacing in my mind I decided to register here. Why was I so hesitant, you might ask.. Because I am not a skeptic, I'm a believer. I am already surrounded by some seriously offensive pseudoskeptics as it is.. But heck why not join a forum of skeptics debunking pseudoskeptics? Actually, I'd like to share a little picture with you guys for a good laugh.. I am coining the term Randiscience, by way of meme. Pardon us if we tend to be a bit standoffish. Your ID alludes to shades of an infamous spammer and troll. Perhaps you know him or know of him? Do you hate atheists? 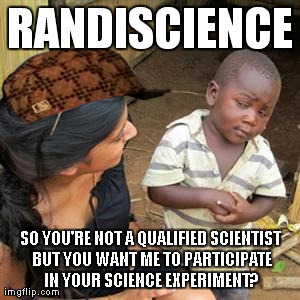 Welcome to the forum: Not sure what science experiments you're suggesting Randi says he wants people to participate in, but one certainly doesn't need to be a qualified scientist to do a scientific experiment - anyone can do so. Having a science background certainly can help in designing a good protocol it's not required. Another person that is fostering a myth about Randi. The JREF borrows scientific methodologies to eliminate cheating and make a test of someones claim as practical as it can be under the given mutual agreement between the claimant and the JREF. It is not meant nor ever was a scientific test. It has always been a wager. Why don't you start a list of topics that require serious consideration and not be automatically dismissed?